A crash course on how to use them, how to ask for them, and how to react if you get it wrong. To most people, pronouns are just a way to refer to someone without saying their name, but pronouns are a major point of stress or pride in some people's daily lives. As someone who is cisgender and my pronouns match how most people would perceive my gender expression, I am in no way qualified to speak to the magnitude of how this affects some people. That being said, I have been collecting tips from people who have struggled with their pronoun usage, I have taken classes and attended workshops on gender and how to be a better ally. Most importantly, I have a platform. I write articles that get anywhere from a couple hundred to over 6,000 views. If this article just gets a few people thinking about pronouns, then it made a difference. What are some common pronouns people use? 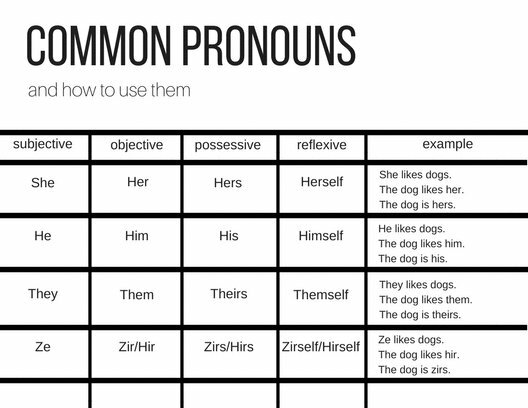 This is not an exhaustive list of all the pronouns that people use, but this is an introduction to some of the common pronouns used today. They are not preferred pronouns, they are just their pronouns. Preferred is just a needless word. They are just their pronouns. Preferred implies that they are encouraged but optional. The truth is, they should not just be a suggestion. Just like your pronouns are not a suggestion, neither are theirs. “They/them/theirs” is usually a safe bet until someone specifies what pronouns they prefer. “They” is a gender-neutral pronoun and can be used to describe anyone. I know some grammar buffs will complain that “they” is plural and it feels weird referring to a singular person with a plural, but I am sure it feels even more uncomfortable to be referred to with the incorrect pronouns on a regular basis and/or having to correct people on the pronouns they use to refer to you. If I, someone whose career is dependant on her grammar skills, can find the strength to use “they”, then you can too. Giving your own pronouns is an easy way to make sure you are using the correct pronouns for other people. This does a couple of things. It opens the door for people to tell you what pronouns they prefer so you don't need to have to be corrected later. It breaks down the stigma around pronouns and lets people know you are someone that is safe to request the correct pronoun usage with. This also can get a conversation started about why your introduce your pronouns and why they are important. If someone corrects you or you use the incorrect pronouns, there is no need to make a huge deal of it. I have heard this time and time again. When people use the incorrect pronouns, they usually make it more about themselves and cause a scene when there does need to be. I cannot speak for all people, but most would rather you just correct your mistake and then move on. Simple, straightforward, and respectful. You don’t need a dramatic and weepy apology about how you are trying so hard to get it right, but it is just so difficult. It is more difficult for them. It is more highly appreciated if you demonstrate that you are working on it and don’t make it about how hard this is for you. At the end of the day, you have to choose whether being considerate of others or your own ideas about what pronouns should be means more to you. I would urge you to evaluate the positive or negative effect it may have on your life vs. the positive or negative effect it may have on the lives of others.